IT HAS often been suggested that Green Revolution took a heavy toll on human health and environment. But studies have never explored the potential damage caused because of high fertiliser and pesticide use accompanied by a shift from traditional multi-crop to mono-crop cultivation, predominantly rice, replacing coarse cereals and pulses. A study by researchers from Canada and India has plugged this hole. It found use of modern technology, high-yielding seeds and intensive irrigation along with the shift unleashed many problems. The study has been published in May issue of Environmental Research. For the analysis, the researchers chose six villages in Gangavati, a taluka in Koppal district of southern Karnataka. They divided the region into three on the basis of agricultural practices prevalent: head end—part which is irrigated and rice growing; ancient—part still practising traditional agricultural methods; and dryland—a rain-fed area growing rice, coarse cereals and pulses. The researchers asked villagers questions about their nutritional status, health, water availability and sanitation facilities. They also collected 20 water samples for checking fluoride levels and 15 rice samples to study pesticide levels. The results showed that in the head end of the taluka, ecological changes accompanying rice cultivation, like decrease in frog population and algal bloom in water because of heavy use of pesticides increased mosquito breeding. This resulted in a surge in Japanese Encephalitis (JE) and malaria cases. The health records at the Gangavati primary health centre showed that incidence of JE was confined to areas near irrigated rice fields due to high presence of Culex mosquito. According to Atanu Sarkar, the lead researcher, standing water in rice fields promotes breeding of crustaceans and insects that attract birds which are reservoirs for the JE virus. Moreover, the traditional coarse cereals diet has been replaced by mill-polished rice which lacks in fibre and is high on starch. This has given rise to diseases like obesity and diabetes more in the head end area of the taluka. The dryland varieties of coarse grains and pulses were less vulnerable to pest problems. High pesticide application led to itching and irritation of skin in 78 per cent population, weakness and giddiness in 36 per cent, breathing problems in 23 per cent of the people in head end and ancient areas. The rice samples also had measurable levels of endosulfan. Average fluoride levels in groundwater samples of the ancient, dryland and head end areas were 2.15, 2.07 and 2.18 mg/l respectively. The permissible limit for fluoride as per Bureau of Indian Standards is 1.5 mg/l. The researchers say the study is a wake-up call for the policy makers who support modern agriculture practices without analysing its impact. We have such a huge population it would be unwise to go back to ancient method of farming so we have to find more scientific way considering all pitfalls of modernity and pseudo science. Congrats for good work. Let me give few of my points to add to this. The health and environmental risks with green revolution technologies, I discussed in my book "Green" Green Revolution: Agriculture in the perspective of Climate Change -- you can access at www.scribd.com or Google book search on my name --. We need to come out of this mess of green revolution technology to save from health hazards and environmental disasters in coming years. We are producing in excess by 50% and by wasting natural resources to that extent along with wasting of energy and water. We can achieve that level production without chemical inputs. Innovative farmers have shown this to nation over different parts of the country. But unfortunately our rulers are more interested to support chemical input technology to help Western MNCs. Even, ICAR is joining hands with ICRISAT a Western MNCs mouth piece. Let the Central and State governments come out of this web -- some states have already come out -- by collating innovative findings of farmers and extended them to farmers in other parts. This will solve the wastage of public money by more than 70% interms loans & chemical inputs. Unfortunately, now government is devaluing rupee day by day to benefit FDI & to benefit those block money tashed in foreign banks by allowing them to bring back by paying the tax -- the tax part is compensated through devaluation of rupee against US$. You gain something at the cost of another thing. We had no option other than increasing food-garin production to feed the nation with an uncontrollable population growth. The mission was accomplished but with a hidden cost on health and environment. Needs complete overhaul of the system and policies. In the agricultural practices by the farmers lack of knowledge is the culprit. Most of the farmers in India are not educated at the level which can realize them what are the potential risks of using fertilizers and pesticides in excess. Educated people like us who are known to it are only commenting on this. Educated farmers are very less in numbers. Need of the hour is that, farmers should also be educated or educated people should adopt agriculture as their profession. Government at its own level can contribute to it by creating awareness. Strict policies related to this issues should be there which is very difficult task as farmers are the major vote bank for politicians. 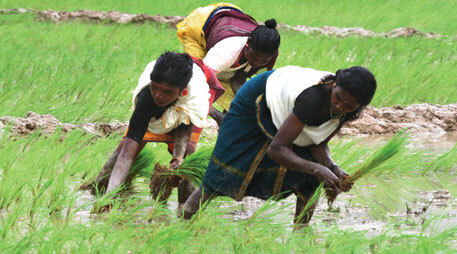 Policies should be framed in such a way that farmers and society both can be benefitted. Organic and biodynamic farming, when done methodically and scientifically, produce even higher yields than conventional commercial farming.